t1 = Turtle ! create. // fill array of lines. lines = Array ! create. [ lines ! ( t1 ! makeFigure ) add] ! (LINENUM) repeat. t1 ! penup  20 linewidth -200 200 moveto pendown 400 4 polygon. wall = t1 ! makeFigure. t2 = Turtle ! create. t1 ! penup (random(360) -190 ) (random(360)  -190 ) moveto (random(360)) direction 0.1 scale. t2 ! penup (random(360) -190 ) (random(360)  -190 ) moveto (random(360)) direction 0.1 scale. [ target == wall ] ! then [ ! (target) (moveself) bounce ] execute. ]. // create 3rd turtle for drawing. t3 = Turtle ! create. t3 ! 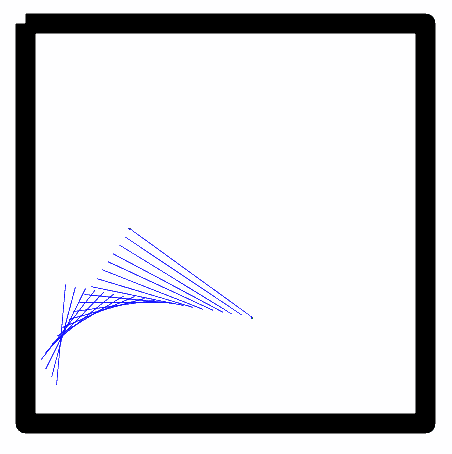 1 linewidth (blue) linecolor. timer1 = Timer ! create. timer1 ! 0.05 interval 600 duration. t3 ! penup (t1!xposition?) (t1!yposition?) moveto. t3 ! pendown (t2!xposition?) (t2!yposition?) moveto. //    t3 ! (Color ! (random(127)+128) (random(127)+128) (random(127)+128) create) lineColor. lines ! (t3 ! makeFigure) add. (lines ! 1 get) ! hide.